Box Text: Interstellar ping-pog with a deadly energy ball! Your spaceship is at the gate of the Alleyway. Use your vessel to repel the energy ball. Atomize space grids with your return shots. Destroy the entire field and move on to even more challenging targets! You're in command in the Alleyway! 07-17-2017 pzeke Description Launch title. 07-17-2017 pzeke Box Text Interstellar ping-pog with a deadly energy ball! Your spaceship is at the gate of the Alleyway. Use your vessel to repel the energy ball. Atomize space grids with your return shots. Destroy the entire field and move on to even more challenging targets! You're in command in the Alleyway! 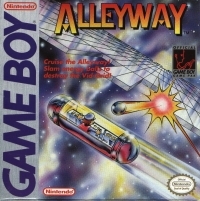 This is a list of VGCollect users who have Alleyway in their Collection. 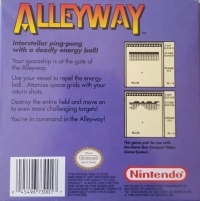 This is a list of VGCollect users who have Alleyway in their Sell List. 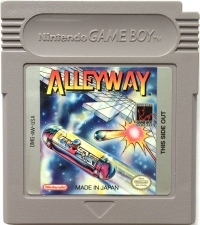 This is a list of VGCollect users who have Alleyway in their Wish List.